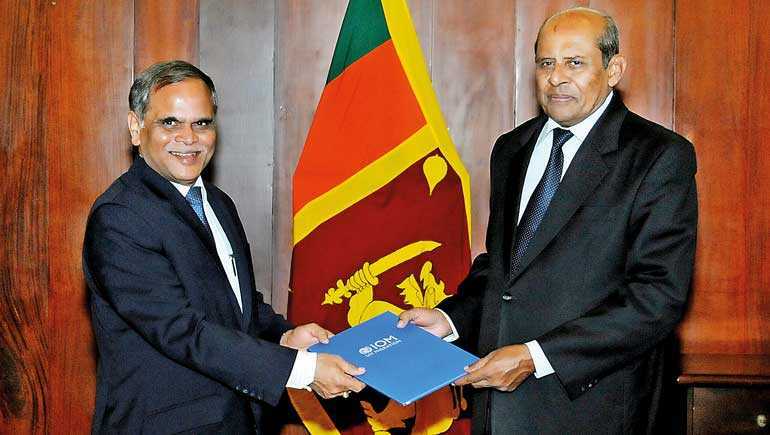 The International Organisation for Migration (IOM)’s new Chief of Mission in Sri Lanka Sarat Dash yesterday presented his credentials to Foreign Affairs Minister Tilak Marapana at the Ministry of Foreign Affairs in Colombo. Dash previously served as IOM’s Chief of Mission in Yemen, Bangladesh, Nepal and Azerbaijan. He was also IOM’s Special Envoy to India and Bhutan. An Indian national, Dash joined IOM in 1998 with over 15 years of experience in the development sector in South Asia. While acknowledging the strong relationship between IOM and his Government, the Foreign Minister emphasised on IOM’s engagement in reconciliation and peace building (particularly in transitional justice), reintegration program and counter trafficking issues. “There is an urgent need for skills development for migrant workers to meet the demands of destination countries,” he added. Dash assured the Minister of his commitment to work closely with the Government of Sri Lanka, UN system and other stakeholders to serve the migrants and their communities around them during his tenure in Sri Lanka.